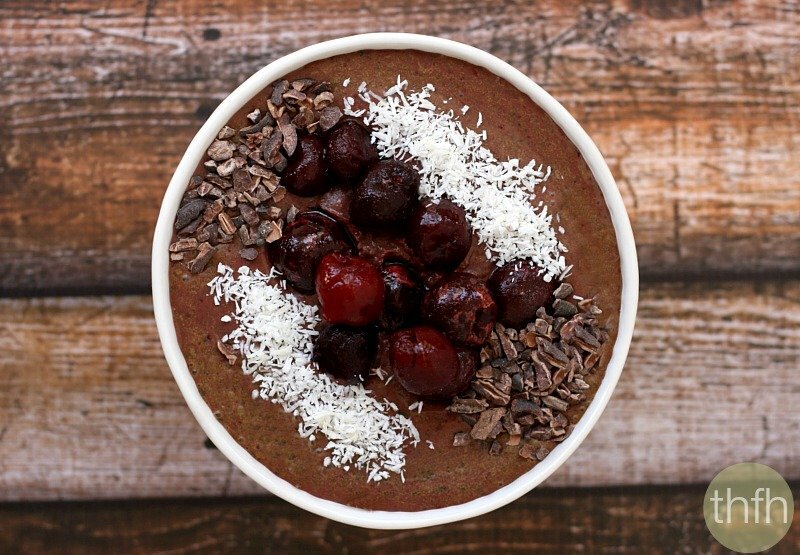 This delicious Dark Cherry and Acai Berry Smoothie Bowl pretty much happened by accident, but all came together just perfectly. Since it was the day before grocery day, I was completely out of fresh fruit. So I checked my freezer, because I always have bags of frozen organic fruit to use for my smoothies and hidden under bags of blueberries, strawberries, raspberries and mango was one little bag of frozen organic dark sweet cherries…so that’s what I used. If you’ve ever tried the frozen acai berry smoothie packs, they have a slight chocolate flavor to them, although they have no chocolate in them at all. They are made from the acai berry fruit which is loaded with antioxidants and healthy omega fats. But when I mixed everything together, it almost tasted like a frozen chocolate cherry treat…it was delicious! Want more healthy smoothie recipes? 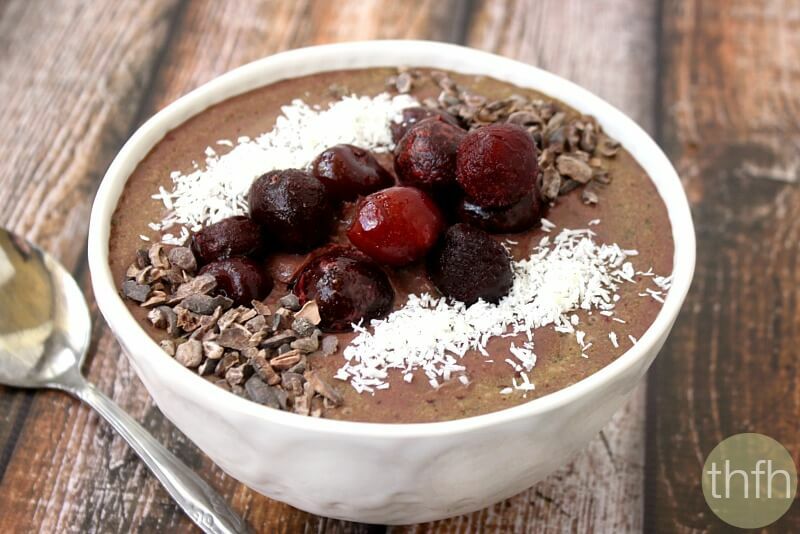 Check out Chocolate Peanut Butter Protein Smoothie, Blueberry Acai Protein Smoothie Bowl, Kale and Banana Green Smoothie, or my Clean Eating eCookbook with an entire chapter of 20 healthy, clean eating smoothie recipes you will love! Tip #1: If you prefer your smoothie bowl to be a little thicker, just slightly reduce the amount of milk. Tip #2: I like to use homemade almond milk when I make smoothie bowls, but feel free to use whatever you have on hand. Tip #3: I added the superfood baobab powder for extra nutrients, but it can be omitted. Tip #4: I used organic frozen dark sweet cherries, but fresh organic cherries should work fine too. Just don’t use the processed, artificially colored “cherries” in a jar that are covered in high fructose corn syrup…bad, bad, bad. 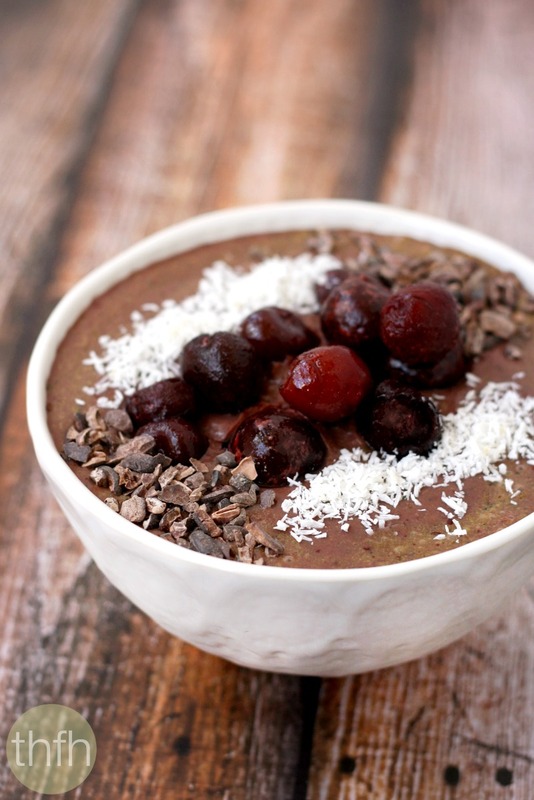 Optional: Garnish with extra cherries, cacao nibs and/or shredded coconut flakes. The recipe and photographs for "Dark Cherry and Acai Berry Smoothie Bowl" by Karielyn Tillman of The Healthy Family and Home are licensed under a Creative Commons Attribution-NonCommercial 4.0 International License and cannot be used without my written permission.